We hope you have check-for-new-versions enabled in the options dialog of Visual Assist, because you wouldn’t have learned about last month’s build of Visual Assist in our blog. We shamefully failed to announce build 2029. Social media isn’t yet part of our build process. Visual Assist build 2029 requires software maintenance through 2014.02.24, and includes our usual mix of features and bug fixes. Change Signature continues to get attention, and in build 2029, you can specify a default value other than “TODO” in call sites when adding a parameter. Also, the aesthetically inclined will appreciate the refresh we gave to our options dialog. Learn what’s new in build 2029, or skip directly to download the installer. Find References has been a feature of Visual Assist for about a decade. And, while Find References now shares its name with a version of the command integral to Microsoft Visual Studio, the original has pragmatic components that should make it the everyday preference. If during the course of programming, you find yourself reviewing or reworking the code surrounding references to a symbol, Find References in Visual Assist can be a handy tool to manage the task. Begin by invoking Find References on your target symbol, with the default Shift+Alt+F or from one of the menus that comprise Visual Assist. Confine the results to the current project or all projects, as appropriate. Clone the results window so you can invoke additional Find References without overwriting your original results. You can identify a cloned window by its title and lack of “Highlight All” checkbox. Double-click or select entries to jump to references, and review or rework your code as necessary. Mark entries “done” by deleting them from your cloned results window. And don’t fret, “deleting” doesn’t modify your source. Refresh the cloned results window only if you make extensive changes to your source and you’re not deleting entries. Although a refresh will update your locations, it will also restore “deleted” entries. Close the cloned window when you’ve finished your review or rework. Finally, explore the other components of Find References integral to Visual Assist. I think you’ll find the effort a worthwhile use of your time. Join Whole Tomato Software at the Build 2014 conference this year, April 2nd-4th in San Francisco. We’ll be demonstrating Visual Assist to the uninitiated, and offering existing customers a sneak preview of an enhancement to the Visual Studio debugger. Stop by to share your stories and suggestions, grab a stress tomato, or show a friend why Visual Assist is a must-have extension. You’ll find us at Build 2014 in the Visual Studio Partner Pavilion. We released a feature some time ago that we failed to document, and since its UI is subtle, there is a good chance you know about it only if you follow our release notes closely. I raise the feature for two reasons: 1) it’s valuable, and 2) now it’s documented. 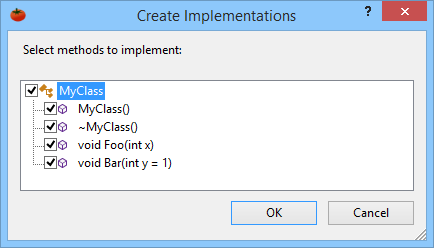 The feature is Create Method Implementations, and it gives you a quick way to create implementations of all methods of a class. Move to the name of a class in its declaration, typically in a header, and select Create Method Implementations from a refactoring menu. For example, press Shift+Alt+Q. A dialog opens, letting you select the methods whose implementations you want created. As with other refactoring and code generation commands, Visual Assist will attempt to create implementations in a sensible location. Visual Assist is clever enough to exclude methods already implemented, so you can invoke the command again if you add a few methods to the declaration of an existing class. You can adjust the format of newly created implementations by modifying the VA Snippet for Create Implementation—the same VA Snippet used by its namesake and Extract Method.